Why would your local Council keep a busy public highway closed for 18 months, racking up bills of over £1m in the process, when a few months’ work and a few hundred thousand would have fixed it? 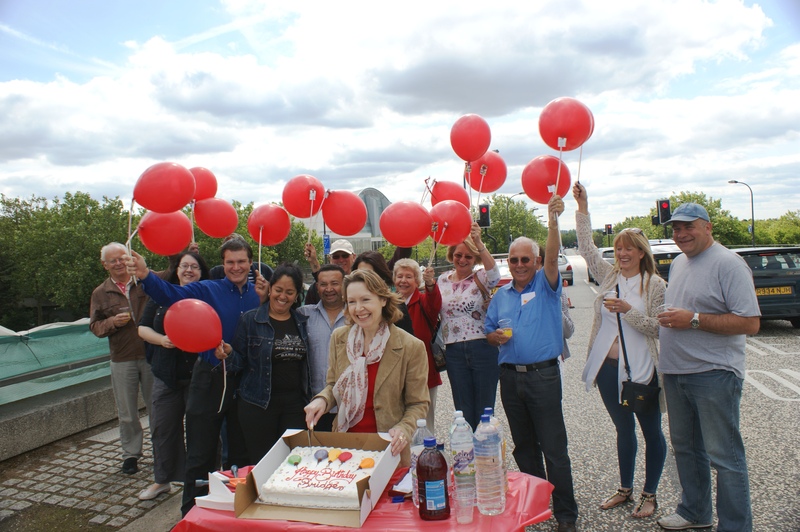 In January 2010 a welder’s spark set off a fire in Milton Keynes Market damaging Secklow Gate Bridge, the busy four-lane highway running through the heart of Central Milton Keynes. Two of the nine, massive pillars supporting the southern section needed repairs. The road was closed for safety reasons, and the deck propped up with a forest of hefty bridge props. Now, with the central route closed, traffic had to detour round the 1km-long shopping building. Trade in the disrupted market took a dive and CMK, famous for its smooth-running grid road system, began to experience the novelty of traffic jams. Eventually, a leisurely nine months after the fire, a highway manager at MK Council issued instructions to sub-contractors to crack on with the repair process. This was 22 Sept 2010. Yet within days, repairs stopped altogether and would only resume six months later, in a maelstrom of public outrage. Official enquiries later revealed that the Chief Executive of MK Council, David Hill, had stepped in to countermand the decision to proceed with repairs. Why? Because suddenly a shinier option was hovering in the air. 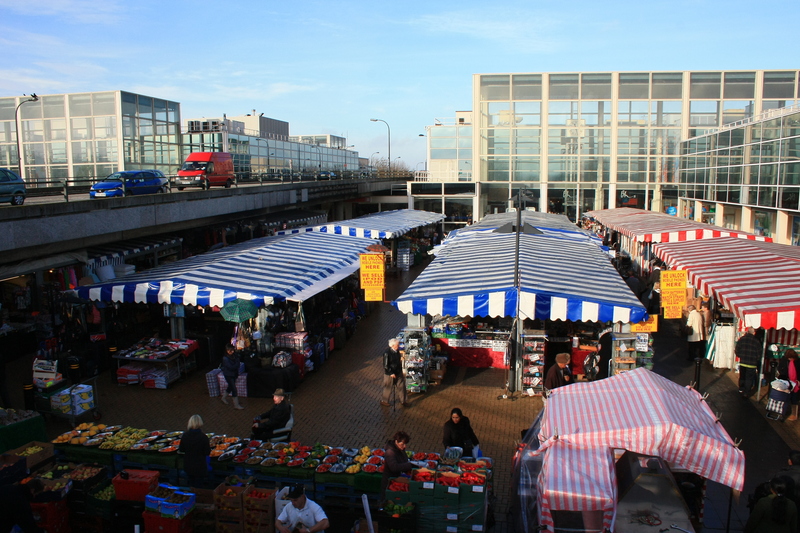 On 27 Sept, just days after repair instructions had gone out, the Chief Executive heard, in confidence, of the possibility of demolishing the public highway to expand the shopping centre. The very next day, he sent out an email saying “We should hold off making any decision between the three [repair] options until the implications are clearer”. With that, work promptly stopped and a small group of senior people waited, patiently, for a planning application to land on the mat. Of course, we, the public knew nothing of this. Indeed, irate citizens were being assured that repairs were in hand. Then, just before Christmas, we got a hefty hint that something had changed. What the political spin doctors didn’t reveal, of course, was that the Council had already spent hundreds of thousands on propping up the bridge, and that every month of delay increased the risk to the public purse. With alarms ringing, Xplain began digging. We immediately suspected that there was only one developer likely to be interested in demolishing a major link in the grid road system that ran over Market Square. It was the then joint owners of the Listed shopping building, the Prudential and Hermes (Post Office) pension funds. Now, the joint owners had been eyeing up Market Square, built into the middle of the elegant, linear shopping building, for many years. To them, it was the ideal location to build another anchor store. The fact that a major public highway, a popular market, and a superb Listed building stood in their way did not deter them. Nor, apparently, did it bother certain figures at MK Council. Cllr Cec Tallack (Lib-dem) was then leader of the Council and his own ward includes CMK, and must have known exactly what was going on. 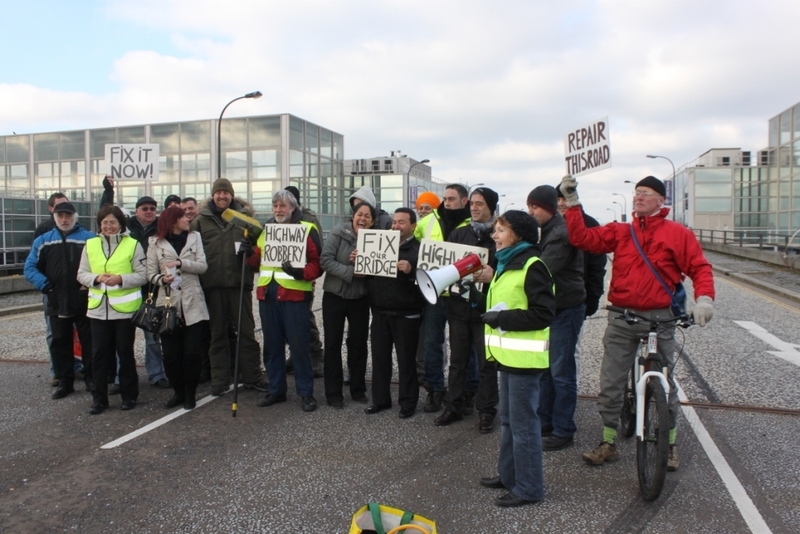 Xplain protesting over the long closure of Secklow Gate, 2011. After several intense months of challenge and protest, Xplain finally discovered through a Freedom of Information request how much the Council was spending to keep the bridge closed. An eye-watering £30,000 a month. This was on an open-ended agreement, and, of course, there was no end in sight! It was a rainbow moment. We knew that no planning application had been filed. We knew that even if it was, it would be hugely controversial, could easily take two years to go through the system, that no insurance company on earth would pay for the rapidly mounting costs, and that this was a massive, needless risk for the Council to take. We knew, in other words, that as soon as this hit the media they would be forced to do their prime, statutory duty, and restore Central Milton Keynes to working order. With the Bridge-gate scandal now making front page news, and calls for the Chief Executive to resign, the cabinet announced the bridge would now be repaired. Remarkably, Mike Galloway, then Lib-dem cabinet member for planning, volubly defended the delays, did not apologise to the public, and stated that repairs would now proceed because the centre:mk weren’t ready to file their planning application! For an authority that is supposed to be strictly neutral towards planning applications this was a remarkable admission. In the end, it only took four weeks to repair the damaged pillars and the Bridge finally reopened to traffic just before midnight on 30 June, 2011. Ten minutes later and MK Council could have been sued. As we celebrated, we couldn’t guess that within months the second battle of Secklow Gate would begin. Only this time the forces ranged against us would be stronger, and detemined to win. And what was the final bill? In March this year MK Council finally released the direct costs of the Secklow Gate Bridge fiasco. Out of a total bill of £1,079,000 the actual repairs cost £311k. 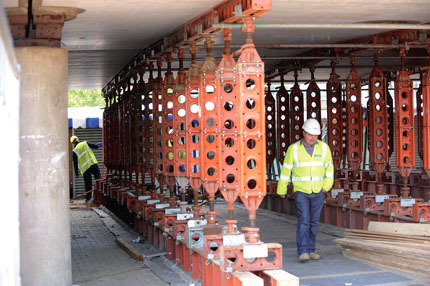 The cost of propping up the bridge for far longer than necessary was £627k, including £172k for ‘traffic management’ costs – which seems rather a lot to pay for a few cones. As we predicted, the insurance company refused to pay all the bills, leaving a shortfall of £355k. That is £355k that the ratepayers of MK have to pay for a murky example of official incompetence. But at least we, the public, got our grid road system back, rescued our much-valued market from terminal decline, and won the first battle of Secklow Gate. This entry was posted in 20th C architecture under threat, corporate greed, Destruction of CMK, General, MK Market, Primark, protecting CMK, Secklow Gate Bridge on March 18, 2013 by xplain.